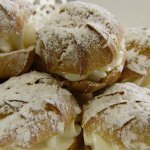 A cream puff is a choux pastry ball that can be filled with custard, whipped cream, pastry cream or ice cream. Profiteroles with ice cream are especially popular in the USA. The profiteroles come from France, the world “profiterole” was borrowed into English circa 1600. The cream puffs were first served in US restaurants in the mid-19th century. Choux pastry is a light pastry dough with high percentage of water which allows to cook hollow pastry that can be filled with cream or ganache. If you want to cook cream puffs, you need to pipe the choux paste through a pastry bag into small balls. When you bake these balls, you will have hollow puffs. Let them cool and inject with cream using a pastry bag or just slice off the tops, put the cream in and reassemble the puffs. The cream puffs may be left plain, decorated, dusted with powdered sugar or garnished with caramel or chocolate ganache. National Cream Puff day is the perfect excuse to treat yourself to a delicious pastry, either store-bought or homemade.